Celebrate Cinco de Mayo or just have a fiesta with the help of PartyCheap.com! We have Mexican garland decorations in red, white, and green made of tissue paper as well as a poly outdoor Pennant Banner you can use outside. Mix and match all of these red, white, and green Mexican flag decorations to create just the right look you need for your Mexican theme party. Make sure you look the part for this Mexican fiesta with the Mexican Serape Costume. And don't leave your guests in the dust. Make sure each guest has a Multi-Color Sombrero and Fiesta Beads with Chili Pepper Medallions for the fiesta as well. Decorate the tables as well, with out wide variety of Mexican centerpieces and confetti. The Fiesta Centerpiece is perfect to spice up the table. Top it off with the Miniature Mexican Sombrero scattered along the table.Entertaining your guests will be easy with out pin the tail on the Donkey Game. No matter what age, everyone will want a chance to pin the tail on the donkey! 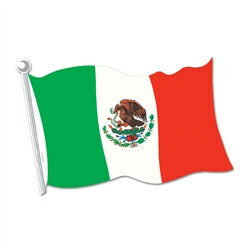 PartyCheap.com has Mexican party decorations and supplies to help you throw a great Mexican theme party. If you are celebrating Cinco de Mayo or just having a Mexican fiesta, we have the decorations and party supplies that will make it a memorable event. All of our Mexican decorations can be viewed here or use the search feature above to find a specific type of Mexican party supply. Cinco de Mayo is a great reason to throw a Mexican theme party! Cinco de Mayo is traditionally celebrated to remember the victory of Mexico over the French in the Battle of Puebla in 1862. Of course, like St. Patrick's Day, everyone is welcome to celebrate this holiday regardless of your ethnic heritage. Most people celebrate Cinco de Mayo with Mexican decorations, Mexican music, Mexican food, and don't forget the margaritas! We have almost everything you need, except for the tequila. It's not a Mexican theme party without green, white and red decorations. 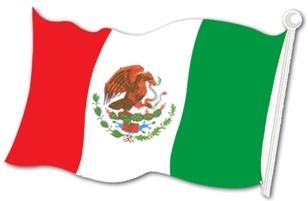 These are the colors found in the flag of Mexico. String up a green, red Pennant Banner. We have a Mexican Flag Cutout with the national coat of arms in the center. We also have Rayon Mexican Flags and a huge 60 foot Outdoor Mexican Flag Banner that is perfect for uses like Cinco de Mayo parties, fiestas, or Mexican food festivals happening outside. Decorate your walls with a jointed mariachi player , some Mexico City signs, or a Cinco de Mayo Sign. If you are looking for hanging Mexican decorations we have them too. Decorate your room with the chili pepper whirls, red/white/green tissue bells, or Chili Pepper Garland. Chili peppers are a common ingredient used in a lot of Mexican foods so we have many chili pepper decorations including chili pepper garland, chili pepper wind-spinners, and chili pepper danglers. We even have chili pepper necklaces you can wear for your fiesta! Of course, no Mexican party is complete without Mexican food. We can't cook for you but we can help you serve the food. Check out our Mexican Food Picks, fiesta dinner plates, and serape design hot/cold cups. We also have plastic chili pepper margarita glasses, margarita dessert plates, and cactus shot glasses all which you can fill with your favorite Mexican inspired drink. We hope you have fun planning your next Mexican theme party or Cinco de Mayo celebration and use us to help you decorate for it. Give us a call at (800) 224-3143 if you have any questions on any of our Mexican party supplies and decorations. Browse our other International party supplies as well!